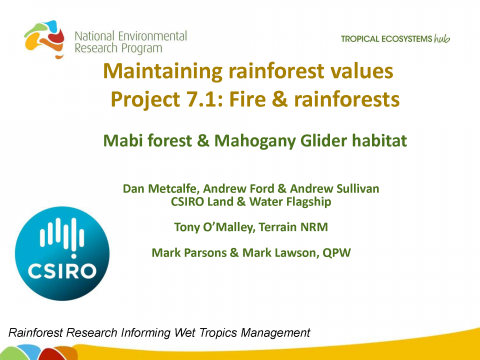 Dan Metcalfe (CSIRO); Fire and rainforests: Mabi forest & Mahogany Glider habitat; Thursday 6th November. 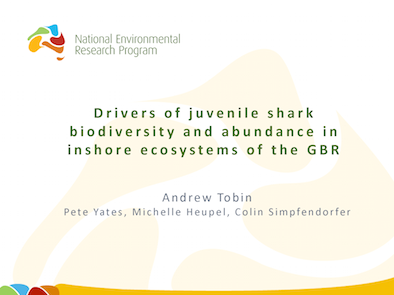 Andrew Tobin (JCU) Drivers of juvenile shark biodiversity and abundance in inshore ecosystems of the GBR; Thursday 6th November 2014. 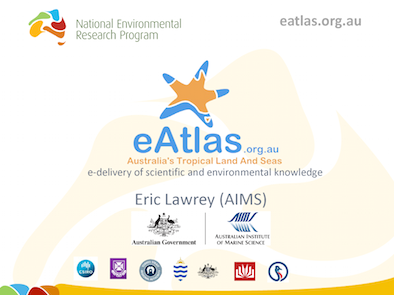 Eric Lawrey (AIMS); eAtlas; Thursday 6th November 2014. 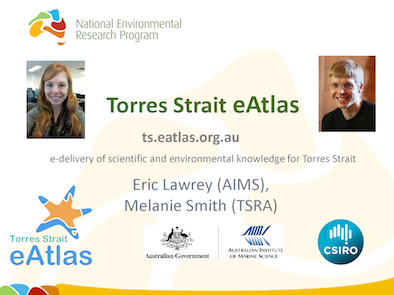 Eric Lawrey (AIMS), Torres Strait eAtlas; Wednesday 5th November 2014. 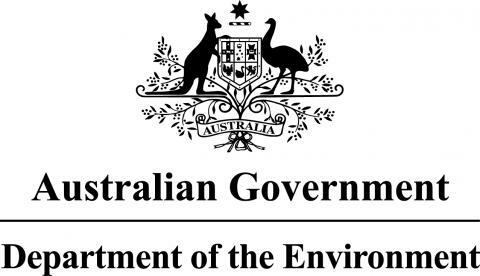 Erin Bohensky (CSIRO), James Butler (CSIRO), Tim Skewes (CSIRO), Yiheyis Maru (CSIRO), Sara Busilacchi (CSIRO), Cass Hunter (CSIRO), John Rainbird (TSRA), Vic McGrath (TSRA), Miya Isherwood (TSRA), Fiona Morseu (TSRA), Cr. 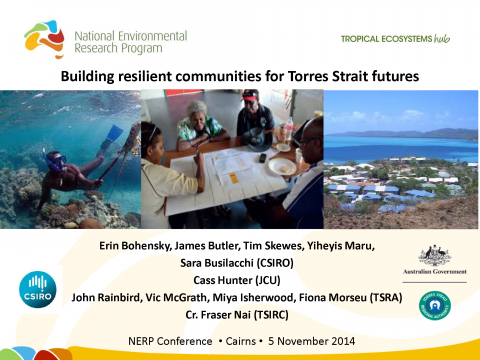 Fraser Nai (TSIRC); Building resilient communities for Torres Strait futures; 5th November 2014. Video to accompany the presentation can be viewed here. 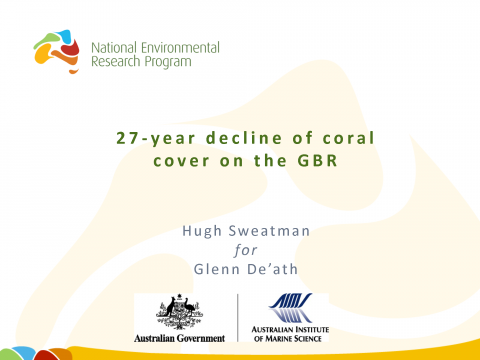 Glen De'ath (AIMS); 27-year decline in coral cover on the GBR; Wednesday 5th November 2014. 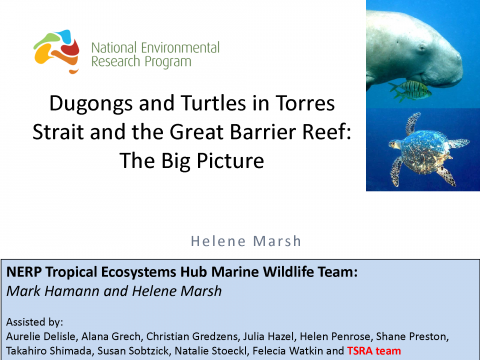 Helene Marsh (JCU); Dugongs and turtles in Torres Strait and the Great Barrier Reef: The big picture; Wednesday 5th November. Hugh Sweatman (AIMS); Down and staying down? 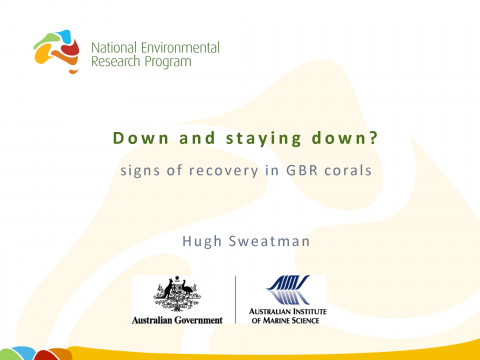 Signs of recovery in GBR corals; Wednesday 5th November. 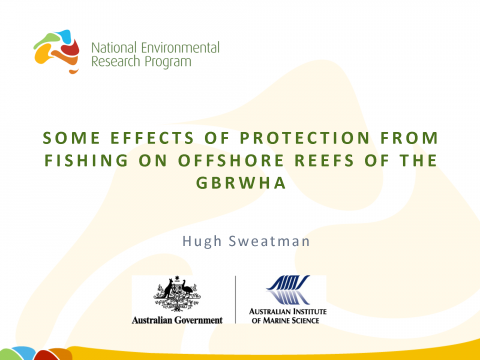 Hugh Sweatman (AIMS); Some effects of protection from fishing on offshore reefs of the GBRWHA; Thursday 6th November. 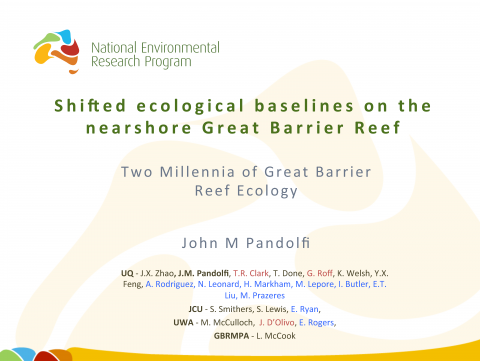 John Pandolfi (UQ); Shifted ecological baselines on the nearshore Great Barrier Reef; Wednesday 5th November 2014.